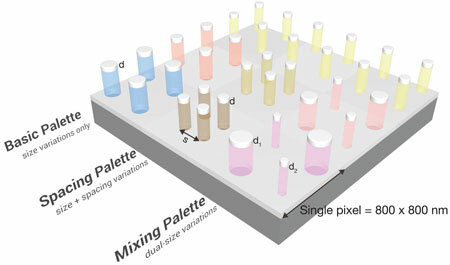 (Nanowerk News) A scheme for greatly increasing the number of colors that can be produced by arrays of tiny aluminum nanodisks has been demonstrated by A*STAR scientists ("Plasmonic Color Palettes for Photorealistic Printing with Aluminum Nanostructures"). Conventional pigments produce colors by selectively absorbing light of different wavelengths — for example, red ink appears red because it absorbs strongly in the blue and green spectral regions. A similar effect can be realized at a much smaller scale by using arrays of metallic nanostructures, since light of certain wavelengths excites collective oscillations of free electrons, known as plasmon resonances, in such structures. An advantage of using metal nanostructures rather than inks is that it is possible to enhance the resolution of color images by a hundred fold. This enhanced resolution, at the diffraction limit of light, is critical for data storage, digital imaging and security applications. Aluminum — because of its low cost and good stability — is a particularly attractive material to use. Joel Yang and Shawn Tan at the A*STAR Institute of Materials Research and Engineering and co-workers used an electron beam to form arrays of approximately 100-nanometer-tall pillars. They then deposited a thin aluminum layer on top of the pillars and in the gaps between them. In these arrays, each pixel was an 800-nanometer-long square containing four aluminum nanodisks. The plasmon resonance wavelength varies sensitively with the dimensions of the nanostructures. Consequently, by varying the diameter of the four aluminum nanodisks in a pixel (all four nanodisks having the same diameter), the scientists were able to produce about 15 distinct colors — a good start, but hardly enough to faithfully reproduce full-color images. By allowing two pairs of diametrically opposite nanodisks to have different diameters from each other, then varying the two diameters enabled them to increase this number to over 100. Finally, they generated over 300 colors by varying both the nanodisk diameter (but keeping all four diameters within a pixel the same) and the spacing between adjacent nanodisks in a pixel (see image). “This method is analogous to half-toning used in ink-based printing and results in a broad color gamut,” comments Yang. The researchers demonstrated the effectiveness of their extended palette using a Monet painting. They reproduced the image using both a limited and extended palette, with a much better color reproduction from the extended palette. Amazingly, they shrank the image from 80 centimeters to a mere 300 micrometers — a 2,600-fold reduction in size. “The use of a more cost-effective metal has the potential to move this technology closer to adoption,” Tan notes.